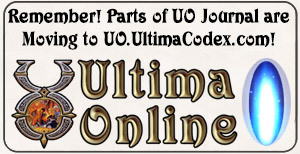 The following is from an artist who works on Ultima Online, and I thought it might be of interest to people, given the issues that are coming up these days, and the amount of silence over the account management migration that UO has went through this month, along with its fellow games Dark Age of Camelot, Warhammer Online: Age of Reckoning. 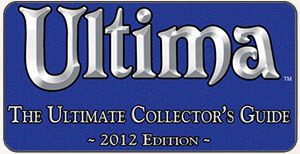 Ultima Online has experienced some particularly severe issues from this migration, compounded by people worried over housing. Over the last 10 days or so, many of those issues have started to be cleared up, and with the game time codes being re-enabled, many more issues are starting to be cleared up as we head towards the Publish 72 announcement, which will hopefully be tomorrow. This was posted on Stratics today, however the thread has been locked and so it will probably be missed by many people. Unfortunately the thread was full of attacks on the UO developer team, so it came as a surprise to many of us that one of those on the UO team decided to speak out. While I strongly disagree with the personal attacks on the developers and UO’s producer – this migration was not of their doing, and I know that many of them have been working extremely late to try and fix things, as have developers from the other two MMORPGs, I understand the frustration with the lack of communication between all three of the teams and their players. Some have the attitude that the developers don’t care or are not working, when that’s not the case – if they weren’t working to try and fix what issues they can, and players started quitting, they would soon be out of jobs. It’s juvenile to assume and publicly declare that it’s all their fault or that they haven’t been trying to fix the issues that are within their responsibilities, and even outside of their responsibilities. The people who make those kinds of attacks will be in for a rude awakening once they have graduated high school or college and have joined the real world. The lack of communication is a serious issue, but what Electronic Arts allows them to publicly say and their commitment to Ultima Online are two completely different things. In my dealings with the developers, artists, and UO’s producer, I have no doubt that all are committed to UO. It would have been easy for many to have moved on to other games, including Star Wars: The Old Republic during some of its major hiring phases, however they chose UO. Anyways, here is the message in its entirety, and as I mentioned, it was originally posted on UO.Stratics.com. hat I’m not any sort of EA spokesperson and I know nothing about the inner workings of this account migration, and any issues it might have and because of that I can’t comment on anything pertaining to it. So for the purposes of this post, let’s set that issue aside. Not a dodge, I’m just not speaking on things I know nothing about. Da**** Jim, I’m a doctor, not an engineer. Ok, and I’m not a doctor, either. Also, after writing this I’d also like to say sorry for sounding preachy, it’s just something that I care a lot about, and that’s dev/player communication. So I think it’s obvious that I second this comment. Woodsman and puni666 and others have made very insightful comments. I can’t speak for my fellow team mates, but I feel pretty sure that most of us know little about the inner working s of the account migration issues and thus really have little to say on the topic that would be of any relevance to the questions you folks have. But I saw this post from Syrus and really felt a pull to make a comment on it, especially in light of some of the other posts I’ve seen on this and other threads about dev posting. This is actually a topic that is important to me, so despite all the warning klaxons going off in my head to just close the browser and get back to work, I continue to type. I want to share with those who are interested my perceptions of Dev/Player interaction and posting on Stratics. You should know outright that for me I believe that Dev/ Player interaction is a privilege, not a right. Player interaction is the probably the most rewarding aspect of this job for me, I kid you not. I have met some amazing people, and have been fortunate to call many friends – even those I’ve only met once, or have never met in person at all. I wish I could put into words what the player meet ups does for me, but in short, it’s a powerful energizer. But it’s not a right and it’s not actually a part of my job responsibilities. I do my utmost to treat it and you guys with respect and honesty so that I can continue doing it. I talk to you folks on this forum with the same regard as I would talking face to face with you. Those who have met me know this. Now from a dev’s point of view posting to Stratics is dicey business – even posting about things we know about. Because there’s so much potential for conversations to devolve. I have really thick skin and don’t offend easily, and if someone has a beef about something I did or didn’t do, I’m all about hearing about it. But the problem comes in when people start using their posts to air out personal grudges, vent frustration, or just troll. When these things occur, and they occur enough, it gives us good reason to give pause about the next time we want to post anything. Given enough crucifixions (to quote Syrus) and the interest in posting at all is gone. And this brings me to the flip side of the coin. If I decided to never post to Stratics again, my job would not be affected at all. I wouldn’t get any emails, or phone calls from team or EA. Nothing. And this goes for every dev on the team. I’ll add that it’s generally not in the best interest of ANY company to let any employee communicate directly to it’s customers because there’s to much opportunity for miscommunication. But this is the exact situation we enjoy here with UO/Stratics. I don’t know if any other team at EA that enjoys this privilege, and I can’t speak for how many other MMO’s have this level of open door policy on a 3rd party forum. I worry that if dev / player interactions are perceived as being too caustic, that EA/ Mythic would determine that all communications would need to be through official EA channels only. I think this would be inconsistent with UO culture, and potentially damaging, but at the same time I can’t say that I would blame them for making that call. Now, I’m not saying the above thing to spark any “If EA does , I’ll quit!” posts. In fact, this is the exact thing I’m advocating NOT doing. At the end of the day, the responsibility is on us, the devs and the players as to how we conduct ourselves in these forums which influences the level of player/ dev interaction. Personally, I want to hear about the things you guys like, the things you guys don’t like, the things you guys would like to see in the future, but I don’t like to hear about how some people think person X should be fired, doesn’t care, or doesn’t know how to do their job, when in fact (and let’s be fair) unless you work on the team, or communicate with us privately, you really don’t know us, what we do or what our responsibilities truly are. And this is just getting back to not commenting on things we really don’t know anything about. IMO, I think it’s totally appropriate to gripe about things that frustrate, as long as the conversation works towards solving the problem and doesn’t devolve into personal skewering. To finish up, you guys are great. I love a constructive (critical) conversation and I hope that I/UO enjoys many more years of this kind of connection between Devs and Players. But we should all appreciate what a rare and fragile privilege this is.